He feels safe in his cage. But if he escapes, you'll never feel safe again. They are the most dangerous mother-son serial killer team in history. "Bloody Mary" Chilmark is certifiable - just ask her doctor. The Darden State Hospital is home to the most dangerous psychopathic killers in the country. But Bloody Mary got out, and raised her baby away from that bad environment.But her son Doc's been arrested, processed, and held at Darden State -- and is considered one of the most dangerous of the hospital's inmates. As wildfires burn out of control in Southern California, authorities face the overwhelming task of relocating hundreds of Darden's patients to other prison hospitals before the raging inferno descend In the frenzy, "Bloody Mary" finds her opportunity to free her son. It's up to Trey Campbell and officer Jane Laymon to hunt for the mother-son duo in the dark underworld maze of the old asylum beneath the hospital. 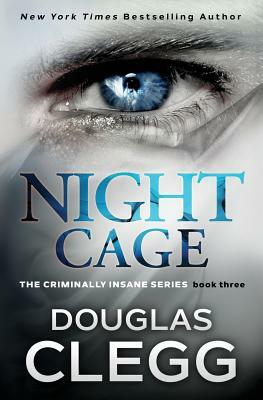 The Criminally Insane Series: Book #1, Bad KarmaBook #2, Red AngelBook #3, Night CageAuthor Note: Night Cage was originally published in paperback under the author's pen name, Andrew Harper. Books by Douglas Clegg AfterlifeGoat DancePurityDark of the EyeThe WordsWild ThingsThe Children's HourThe Criminally Insane Series: Bad Karma Red Angel Night CageThe Harrow Series: Nightmare House Mischief The Infinite The AbandonedThe Hour Before DarkYou Come When I Call YouNaomi The Nightmare ChroniclesThe Machinery of NightIsisThe NecromancerWith more to come... Praise for Douglas Clegg's fiction "Clegg is the best horror writer of the post-Stephen King generation." -- Bentley Little, author of The Policy"Clegg delivers "-- John Saul, bestselling author of Faces of Fear and The Devil's Labyrinth. "Douglas Clegg has become the new star in horror fiction." -- Peter Straubauthor of Lost Boy, Lost Girl and the New York Times Bestseller Black House (with Stephen King)"Clegg's stories can chill the spine so effectively that the reader should keep paramedics on standby." -- Dean Koontz"Clegg is one of the best "-- Richard Laymon"Douglas Clegg is a weaver of nightmares "-- Robert R. McCammonauthor of The Queen of Bedlam and Speaks The Nightbird.FIC030000FICTION / Thrillers / SuspenseFIC031040FICTION / Thrillers / MedicalFIC025000FICTION / PsychologicalFIC022000FICTION / Mystery & Detective / GeneralFIC015000FICTION / HorrorFIC050000FICTION / Crime.